Below is a 20 second video of the angled dogwalk ramp. I leave the plank angling off the porch over one of two sets of stairs most of time. I can close the gate at the top to block access if there is snow or ice on the plank. Although since the rubberized surface is black, snow melts very quickly plus NADAC rubber is amazingly non-slippery, even when wet. So now, instead of the dogs running up and down the stairs to and from the backyard, they now mostly run up and down the plank. At first, if they saw a chipmunk or something, they would leap off before reaching the bottom of the plank. But that was WAY BETTER than the way they used to leap off the porch if they saw a chipmunk, bypassing the steps entirely, which always made me cringe re: the impact onto the blue stone slab below. Surprisingly, training running contacts on a plank placed over the stairs helped both dogs generalize the behavior to the stairs as well and now they tend to run all the way to the bottom of the stairs too. At this point, when they run all the way down in route to the backyard, I praise them and when they occasionally leap I say OOPs. That is the extent of the feedback they get outside of “official” training sessions. But I think it has had a significant impact over time and its rare that either dog leaps off the plank OR the stairs. Most agility competitors have heard the training analogy about learning to drive slowly in a parking lot, then a little faster on side roads, and then eventually driving faster yet on highways. That analogy seemed so logical that I never questioned it… until recently. What made me question it was an observation I had made about my 3-year-old Australian Terrier, Lil. Keeping with the driving analogy, Lil has always run agility like a Volvo XC. She is solid, reliable, powerful, and comfortable on both winding mountain roads and highways. But between the ages of 2 and 3, Lil’s inner Maserati started to kick in and she began to falter. It looked to me like she did not know HOW to drive her new race car. Lil’s foundation training included a lot of backyard (and living room) training. We did a ton of shaping and trick training to teach her how to learn while also developing body awareness. We played impulse control and recall games, did flat-work, banged on boards, ran over flat and slightly raised planks, did jump grids, and began developing distance skills. Everything appeared to be going very well and by the time Lil was 2.5 years old, she was running Masters level courses in USDAA with good consistency and speed. Getting back to the driving analogy, Lil was like a turbo charged Volvo XC– able to negotiate over a variety of terrains/ obstacles at speeds reasonably faster than the speed limit/ SCT. This would have been perfectly fine if my goal was to have a consistent dog with good speed, since that is what I had (and appreciated). But when I watched videos of Lil’s runs, I could see that she did not look 100% confident and thus was not running nearly as fast as she did when we played fetch or when she chased chipmunks or ran in the woods. I thought agility would be even more fun for her (and me) if she learned HOW to run agility courses as fast as she was able to run and jump over logs and branches in the woods. Back to the driving analogy–I cannot imagine suddenly swapping out my Volvo XC for a Maserati and feeling confident driving 100+ MPH, even on a wide-open highway, without having to first learn how to drive this very different machine. I can only imagine that I would take my foot off the gas, and perhaps even hit the brakes, and drive slower in general if I felt insecure about my driving abilities. And that is exactly what I thought was going on with Lil. In early 2011, I signed up for Silvia Trkman’s on-line Agility Foundations class (http://silvia.trkman.net) and began the process of retraining both of my dogs from the ground up. I have continued to follow Silvia’s training methods for nearly a year now and both my dogs are running better and better as time goes by, with YPS often hovering around 5 YPS and sometimes even breaking 5 YPS. Silvia’s training method is like sliding into the driver’s seat of a Maserati and pressing the pedal to the metal but doing so in a wide open and thus totally safe environment and then gradually adding various driving challenges within that open space. That fun thought inspired me to write this post about backyard training because I did 90% of Silvia’s course work in my backyard with just 5 jumps and a tunnel! One particular comment by Silvia made a lasting impression on me. She said that she does not see many dogs trained using her methods with jumping issues. That really surprised me, because at any given trial, I tend to see at least a few dogs struggling with jumping, including my own at times! On a side note, I can’t express how upsetting it was when I was watching a video playback of one of Lil’s runs, and heard a random bystander declare “That dog has ETS” after Lil crashed into a jump after flying off the A-Frame due to being startled by the judge’s sudden burst of energy close-by (not one of my favorite agility moments). I wish I knew who it was so I could explain that misjudging an occasional jump does not constitute ETS. Anyway, one of the most important things I learned in Silvia’s class was how to SEE what is really going on when dogs are running and jumping. It was great to be able to watch various breeds progress through Silvia’s class and to see how structure affects jumping styles. Over time, I was able to pinpoint Lil’s specific jumping issues, including a huge AH HAH moment when I finally noticed that Lil appeared to have developed a “preferred landing spot” that was approximately the same distance from every jump, regardless of her take-off spot. Prior to noticing this, I assumed all trajectories that peaked before jumps were due to early take-off. Needless to say, I was blown away. Since that realization, I can now also see when other dogs appear to have “preferred landing spots” that are too close OR too far from jumps…the later including some very high-ranking Border Collies. I have heard people refer to dogs whose jumping arcs peak after bars as late jumpers. But are they really late jumpers? Or are they late landers? 🙂 Their take-off spots tend to look similar to other Border Collies of comparable speed. And if it is indeed a landing issue, how do we know if these dogs would benefit from training them to land a bit closer to jumps? Because it was beneficial for Lil to learn how to land further from jumps? Not necessarily. However, I could argue that it might be beneficial, assuming it is true that longer float times add fractions of seconds, or if landing long causes dogs to knock occasional bars due to having to flip their rear legs up higher and hold them up a fraction of a second longer than they would if their jumping arcs were perfectly centered over bars. But I could also argue that perfectly centered jumping arcs may not be attainable or desirable for every dog and instead of trying to get all dogs to jump mechanically “perfect” or what we think of as perfect, why not allow dogs to choose their own styles of jumping, based on their particular structures, and then do our best to help our dogs perfect their particular styles so they can run agility with full confidence and speed. (above) Lil one year later, running Masters/ P3 Jumpers after taking Silvia’s class and doing various jumping “experiments” for several months. Lil looks so much more confident about jumping and is able to run faster as a result. The knocked bar was caused by my deceleration to rear cross vs. continuing with fluid motion with a blind cross. Silvia was totally open-minded about my experiments and was impressed by the results she was seeing with Lil and recommended that a few other people in the class do with their dogs what I was doing with Lil. One of those teams continued with my jumping experiment after Silvia’s class ended and I’m pleased to say both Lil and the other dog are both jumping remarkably better today then they were a year ago! The following video is from a recent backyard training session with my two Australian Terriers, Jake and Lil. My intention was to practice forward-moving rear crosses and jumping in extension but Jake’s reps ended up being more about sends to the tunnel, which can be a bit iffy for him at times. Lil’s session begins at 1:05 minutes. I think she did a great job driving her inner-Maserati. Here’s another backyard session with Lil from June 2012, after a few months of jumping “experiments.” This was before her first NADAC trial in a year and a half so I wanted to reintroduce her to NADAC spacing and to practice jumping in extension through turns. All along the way, I had been sharing Lil’s progress with Dawn Weaver from the UK (http://www.dawnweaveragility.com), because an important part of my jumping experiment emerged from her contact training method. Dawn tested it with two dogs who had jumping issues and both dogs responded as well as Lil did. At that point, Dawn asked me if I’d like to partner up to develop a jump training program to help dogs with jumping issues. I said yes and over the past 6 months, Dawn and I co-developed HGR. The name “Hit the Ground Running” highlights the fact that HGR is not about dogs learning how to jump “pretty” or “perfectly” but rather it is about helping dogs learn how to run fast and navigate efficiently enough over jumps that they can Hit the Ground Running towards the next obstacle with full confidence and speed. In early July, we began a test study of a diverse group of dogs with a diverse range of jumping issues. The test study was free, so we had some early drop-outs, but all the dogs who progressed through the program showed remarkable improvements in overall confidence and developed more efficient jumping styles as well, which equated to faster course times and perhaps more importantly, equated to the game of agility being more fun to play…for both the dogs and humans! The first official HGR class launched in mid-November. Of the teams that have already posted videos, it looks like we have a great group of dogs and trainers. We decided to keep the HGR format as an on-line classroom so we could see how dogs are progressing and make suggestions along the way like we did with the test study group. We also decided to break HGR into 4 separate modules so people could pay as they go and wouldn’t have to make a big time or financial commitment before they could determine if HGR is right for their dogs. 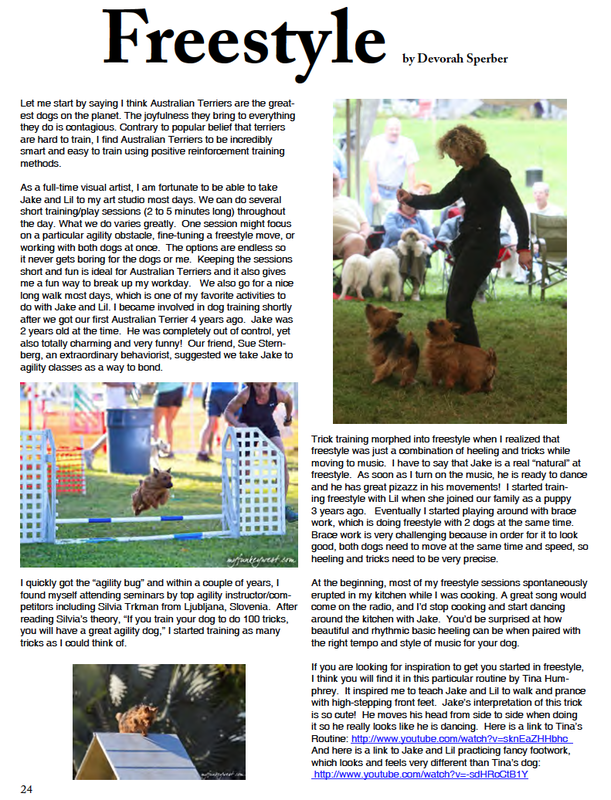 This post was written for the Dog Agility Blog Action Day. Check out other posts here. Jake is back! 🙂 after taking a few months off due to a soft tissue injury. He ran incredibly well and his focus was unwavering the entire weekend. I could not be more proud of him. His jumping style started off looking a bit YAHOO 🙂 but by the time his Standard run rolled around on day 2 (the 3rd run on the video) he had settled into a nice rhythm and was jumping efficiently (like he does at home). Lil had another spectacular weekend. She is in Elite in most classes now and her YPS are continuing to increase so its more fun than ever to run with her. Her Elite Standard run on Saturday was 4.46 YPS (with 2 A-Frames) and on Sunday it was a whopping 4.78 YPS. Too bad I didn’t walk the closing on Sunday and thus did not support the last hoop. I don’t think I’ll make that mistake again! Sorry if the text and images are a bit fuzzy. That is the highest resolution I was able to upload. Things are really starting to fall into place! I couldn’t resist any longer and set up Silvia Trkman’s Lesson 5 sequence this morning. The video includes every repetition and a lot of mistakes, plus some late verbal cues (one was so late, I think Lil had already taking the jump when I said WRAP… big OOPS on my part) but I was SO happy with Lil’s energy and speed that I just kept going. An extension jump after a tunnel is a difficult jumping scenario for Lil so the fact that she jumped #7 so beautifully once and pretty well some other times made my day! I don’t think you can see how YAHOO Lil was in the video, which I think caused some early knocked bars, but she seemed to figure things out without losing her YAHOO-ness or speed. I feel like everything is starting to fall into place and that Lil’s confidence and jumping skills have improved enough that she can now jump while running super fast!!! I am not sure the angle of the camera accurately conveys her ground speed but she was really running! Yet another reason to love Silvia Trkman….like anyone needs one! My recent post for Silvia’s Agility Foundations class: Here is a short video of Lil’s current serpentines plus a few reps jumping over angled jumps. We have not practiced serps for a long time due to focusing on straight jumping and cip&cap. Lil will normally seek out and take serpentine jumps with very little support from me. I wonder if the reason she ran past some jumps was because I was not in my usual position (which is typically further ahead). It felt good to feel rushed by Lil’s increased speed and drive over the jumps. I definitely felt more comfortable when I took more of a head start and was a bit further ahead of Lil. I’m not sure any of this is visible due to the camera angle though. Lil’s speed has picked up considerably since starting this course and as a result I am having so much fun running with her….not that it wasn’t fun before! It’s just more fun now! Now I just need to be disciplined enough to do very little jump training between now and next weekend since we have another trial. Jumping has become so much fun its like eating ice cream… hard to stop until the bowl is empty! But I want Lil’s “jumping bowl” to be over-flowing for the trial! That sure was fast! Great job! She is really flying, so… – who cares about a couple of missed jumps You do want to be ahead for a serpentine yes and you can help some with the arm too, you just don’t want to do any extreme turning as you want to keep running. Lil’s jumping is getting better and better! I finally got to practice the Week 4 sequence for the first time yesterday, but when I got to the training facility, it was raining so I had to set it up indoors with limited video positions but I think it was good enough to get the general idea of things. I threw in some extra straight jumping, since that is what we’ve been mostly working on, and I also rewarded mostly after straight jumps (vs. wraps) for the same reason. I thought Lil jumped the back sides of jumps better when I said AROUND vs. WRAP. ps–AROUND is the word I’ve been using since Lil was a puppy so I think I’ll continue to use that word for the back-side of jumps. It stopped raining so we moved outdoors and finished the session with some extension jumping. Lil’s speed and confidence over straight jumps feels so much better than when we started Silvia’s on-line class. I started with 8′, one-stride spacing then tried 16′ spacing and I thought Lil managed it pretty well. She still tends to launch a bit over the first jump but I think that is slowly improving too (and she didn’t even do it every time today). This was the first full session of jumping we’ve done in a while and I don’t intend to do more than one session like this per week but Lil seemed totally fine throughout the session and is currently racing around the house, so I don’t think I overdid it. I am hoping the improvement I wrote about is visible on the video vs. only existing in my mind due to wishful thinking. Yes, her jumping sure looks great now! Really fast and smooth, with no real launches! Anyway, we’ll get to “around” in the next lesson, but around doesn’t necessarily mean collection, so you certainly still need a collection word on 6. In some situations, I’ll say both, around + cik/cap, but I wouldn’t say around at all at 6 because the dog is already on the right side of the jump, so they need collection info much more as “push out and jump toward me” info. The Mid-Hudson Kennel Association (MHKA) hosted an AKC trial 20 minutes away from my house last weekend. I usually have to drive 2 hours for “local” trials so this was a real treat. This was our first trial since January 1, 2012. And after four months away from trialing, I noticed that my priorities have shifted. While I still enjoy having clean runs, I realized that I don’t have big goals in terms of agility and I don’t care about titles, which puts me in perfect alignment with my dogs, who could care less about Qs, ribbons, or titles. 🙂 My only goal at this point is to have the fastest and funnest runs possible with each of my dogs and that is what we did this past weekend! Everything I’ve been doing as part of Silvia Trkman’s on-line class appears to be paying off with Lil. She was the fastest dog in her class (all size dogs) in Open JWW and took home 4 First Place Ribbons and earned her Open JWW Title. I felt that Lil powered over jumps well and handled spread jumps with ease. She had great obstacle focus all weekend and aced her two Open FAST runs, one of which included a tunnel to a WRAP at a distance, then back to the tunnel. Her line and speed were unwavering (no video unfortunately). Wind is like a giant tug toy to Jake in that it really revs him up and it was very windy most of the weekend. In addition, it takes Jake a while to get used to being in a new environment with a lot of dogs around, especially when we have not been trialing for months. On Day 1 we had some start line issues related to over stimulation and stress. So on Day 2, I decided not to ask for a Sit Stay. Instead I started Jake’s runs by restraining him, then releasing to the first obstacle. I think this method is perfect for him at this point and time because it directs his high-on-life energy towards the course vs. me trying to suppress his excitement by asking for a Sit Stay. This decision is in keeping with Silvia’s thoughts about honoring the dog/s we have vs. trying to make every dog fit into the same mold. I am certain that her approach is the right one for my dogs and me. There were a lot of people at the trial whom I have known for years and talking to them made me reflect on the journey I have taken with Jake and Lil so far. Jake has always been high on life, ever since he joined our family at the age of 2. It is who he is and my husband and I love him for it. He is sweet, affectionate, funny, smart, and I believe he always brings forth his best effort. Lil has always been a real worker bee and rather serious about her “job” and she does it well. She has been this way since puppy hood and my husband and I love that about her. I feel so fortunate to have such great dogs! For the record, I do NOT think Lil has ETS (Early Take-Off Syndrome). The reason I am focusing so much attention on Lil and jumping is because all dogs occasionally misjudge the distance or height of a jump and knock a bar. Some dogs don’t seem to care, but I know with my dogs, if they knock a bar, they both tend to “try harder” not to knock additional bars. There are many ways dogs can “try harder” not to knock bars. They can over-jump, fling themselves over jumps, flip their rears up in an exaggerated way, tuck their back legs in tightly vs. extend them, drop their heads and shoulders before jumping, slow down, or any combination of the above. Because Australian Terriers are such powerful little dogs, I think it is fairly easy for them to jump inefficiently and if repeated enough times, an inefficient style of jumping can become habitual. Dev: We had a typical practice session on Sunday, and included a lot of A-Frames, since I normally only have access to the one in my studio. Lil’s A-Frame striding was not consistent, but she mostly hit well within the contact zone (a couple near the line, which I didn’t like very much but definitely in). The A-Frame was set at 56″ which was 3″ higher than it was the last session at the studio. The other reason I included footage from this practice session is to show how Lil is jumping. I’m wondering if perhaps I should take a break from straight extension grids and just focus on cip&cap. Or perhaps change the spacing of the straight grids to force a little more collection? Based on the practice session, Lil’s jumping was on my mind so I watched a few of her USDAA runs from a year ago where she had some faster and slower runs. I think overall Lil takes better set up steps when she is running slower (taking shorter strides vs. longer full-out running strides). At this point I don’t know which style of running and jumping I should be encouraging? Do I set up jump grids to encourage shorter strides and prettier jumping? But if I do that, will Lil lose speed?…. Speed is way more fun for me and I assume for Lil too???? Or do you think it will be a trade off with a dog built like Lil… that she will either run fast and jump early or run slower and jump prettier/better? 99% of the time, when she jumps early, it looks like it is easy enough for her to do. I have been doing single cip&cap at 8″ recently, as seen at the end of the video.